DescriptionScooter for young children, with T-bar like the grown-ups! T direction bar, like the grown-ups! Suitable for children from approximately 3 to 5 year old. When your child becomes to be "too old" to stroll the city in a pushchair, renting a child scooter is the perfect alternative solution. 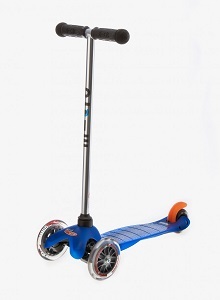 With its 3-wheels plateform, this scooter is perfectly stable for children. Light scooter, you'll be able to carry it easily if needed. Your child will have fun when visiting the city and the whole family will enjoy it.